I'm not a sport kinda guy. When I was small, I used to play soccer as goalie until the 2nd grade when I realized that I have to use eyeglasses. Minus two. That explains why I was never been able to catch the ball, I thought. Anyway, since that time I have never been involved in any serious sports anymore. I do sport only in my PS2. Soccer? Winning Eleven for sure. Golf? Tiger Wood's. I can even drive very fast in Need for Speed. Well, at least I can have exercise for my thumbs. I swim almost every day in the small swimming pool on the roof of my new apartment, but I don't consider it as sport. Sport means get sweaty. Playing inside the water for an hour or two definetely will not make me sweaty. Or perhaps that's only because I can't distinguish between the pool water and my sweat? Hmm. After I decided to resign from my current company, I was looking for some activities that I can do only in Dubai. I want to do something that make me remember this place. You never know, I may not get a chance to work in this country anymore. Dubai offers quite lots of activities, for both outdoor and indoor. The only drawback is during summer the heat can go beyond 50 degree celcius. Even local authority never confirm this, since according to the regulation beyond 50 degree all outdoor activities must be stopped completely, but you can see it really happens if you have temperature sensor in your car. So four wheel driving in the desert, no way. Surfboarding, too hot. Rock climbing, never seen it and even it exists it will be too hot. Drag racing, no I don't consider it as sport. No sweaty. Perhaps the people who watch will get sweaty hoping their love one to win, but nah. And it's too expensive! Then two weeks ago I was roaming around one of the shopping mall in Dubai when I saw one activity that I always wanted to do but never had guts and chances to do it because of the nature of my work and my CCIE journey. Dubai has the world's third largest indoor ski slope and the only one in the region, offcourse, called Ski Dubai. 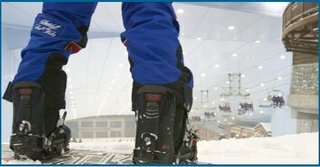 Measuring 400 meters and using 6000 tons of snow, it offers consistent -1 to -2 degree celcius temperature. So only in Dubai you can experience 50 degree celcius in the desert and sub zero in Ski Dubai, in the same day! Since I have decided to drop my CCIE Service Provider journey until Cisco upgrade all the lab equipments to 7200 series, I have plenty of time to spent. So here we go. I registered my self for snowboarding beginner class last week. After 3 lessons and falling down around 2347 times, I realize what the most important thing in snowboarding. Control. And just like CCIE, what requires is practice, practice and practice. The good thing is I don't have any target to catch. There is no exam that I need to attempt. Only that there will be snowboarding 5-days bootcamp starting on August 5th to learn freestyle from Burton's professional snowboarders and I don't want to miss it. I have to be in Level-2 to be able to join this bootcamp, this means I must be able to perform S-turn and small ollie in beginner slope. Well, looks like I have to get ready then. I'm a goofy and my board is 145.